Ointments are helpful if they are not too thick and are uncomfortable. Creams can be used too. Bath oils work sometimes and all of these work best when applied after bathing. Corticosteroids are very helpful and are used by applying them to the skin. These are not the same steroids athletes use. Prescription steroids are more powerful and effective than the over the counter weaker versions of the same medications. These we will calm the effects of the itching and redness. Antihistamines are used to reduce the intense itching apparent in many children. The side effects can cause sleepiness or irritability and their use is on a case by case basis. Antibiotics are used when the sever scratching can contribute to infections of the irritated, inflamed skin. Over the counter use of neosporin, bacitracin or Betadine might work well, but in some cases I will need to determine the degree of infection and the need for oral antibiotics. Atopic dermatitis might disappear in older childhood or adolescence. 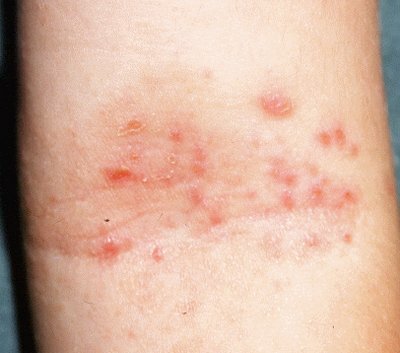 It can persist through adulthood, especially if the family history of adult eczema is present. Atopic dermatitis should not be disabling or disfiguring if adequate efforts are made to treat it.